16 pp (including covers) coloring book. The front cover is in color, depicting a boy riding a flying red crayon to a castle in the sky. The coloring book acts as advertising for the neighbor hood of La Jolla (within San Diego). There are pictures for children to color of different stores, such as Susan's Toys, Harry's Coffee Shop, or Old Europe (a sandwich shop). There even coupons for one to cut out and use at the stores. Measures 10 3/4" x 8"
128 pp. Brown hard cover book, with illustrated book cover. This book gives detailed instructions on how one can make both their own dolls and their own dollhouse filled with homemade doll furniture. The book jacket states, "One does not have to be gifted to make a doll or doll house or doll clothes.... Mother and child together- and even brother and father, for there are boy dolls too- will find making a doll or doll house a game that the whole family can enjoy." The book starts with a simple rag doll, before showing the reader how to take that design and change it into dolls from all around the world, such as a French doll, an Eskimo doll, and a Chinese boy doll. The book continues on to different types of dolls, such as twig dolls, and sock dolls, before moving on to doll clothes and finally doll furniture. The furniture is all made from various, cheap and easy to find materials. Such as a canopy bed that uses a bit of fabric, empty candy box and four pencils. The book is full of black and white illustrations (often with the background of the drawing showing an accent of color) that show the reader how to put together the various items. Measures 8 3/4" x 5 3/4".. The book jacket shows minor edge wear due to rubbing. It also has a few small tears along the edges. 107 pp. A comprehensive guide to various patterns for needle point utilizing the manufacturer's products to make them. This catalog is the 8th in the series. It starts with a beginners guide to needlepoint, along with B&W photographs of the various stitches used in needle work. The treatise includes B&W illustrations of the designs, and templates for them, as well as 20 color illustrations of completed designs. The templates are for a variety of nature inspired elements, including plants and animals, as well as decorative styles, such as eyelet stitching. Measures 8" x 5 1/2".. Front cover fully detached, back cover partially detached, with most of the back strip missing. The interior pages are toned, with some stains. 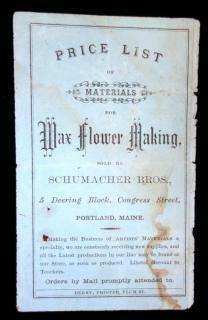 Price List of Materials for Wax Flower Making Sold by Schumacher Bros. Schumacher Bros.Portland, ME. Circular folded into 4 sections, printed on blue paper. Lists the prices for all of the different things needed to make wax flowers, accompanied by pertinent details. Products include sheet wax, wire, gilt leaf moulds, wooden moulding tools, tin flower cutters, looking glass stands, and "extra fine colors" with elegant sounding names, commonly known in this period but alien now, like 'Naples Yellow' and 'Violet Carmine' and more. 5" x 3". [folded] . Le Lilliputien . A Rouyer, Editeur, Paris. No. 359 - Handwork Patterns Secular Subject Matter, April 1877. ..
A 4 1/4" x 2 5/8" wrapper with nine fold-out pages of cross-stitch or petit-point patterns All in full color. The reverse advertises different products and locations in Paris. This pattern booklet was for April 1877..